HANGZHOU, China, Oct. 22, 2014 – Boeing [NYSE: BA] and Commercial Aircraft Corp. of China (COMAC) today opened a demonstration facility that will turn waste cooking oil, often called “gutter oil” in China, into sustainable aviation biofuel. 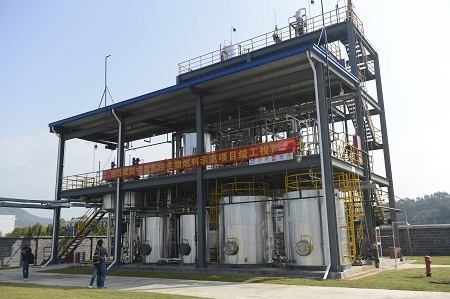 Shown here, the new China-U.S. Aviation Biofuel Pilot Project in Hangzhou, China, will clean contaminants from “gutter oil” and convert it into sustainable aviation biofuel. HANGZHOU, China, Oct. 22, 2014 /PRNewswire/ -- Boeing [NYSE: BA] and Commercial Aircraft Corp. of China (COMAC) today opened a demonstration facility that will turn waste cooking oil, commonly referred to as "gutter oil" in China, into sustainable aviation biofuel. The two companies estimate that 500 million gallons (1.8 billion liters) of biofuel could be made annually in China from used cooking oil. "Strong and continuing teamwork between Boeing and COMAC is helping our industry make progress on environmental challenges that no single company or country can solve alone," said Ian Thomas, President, Boeing China. "By working together for mutual benefit, we're finding innovative ways to support China's aviation industry and build a sustainable future." Boeing and COMAC are sponsoring the facility, which is called the China-U.S. Aviation Biofuel Pilot Project. It will use a technology developed by Hangzhou Energy & Engineering Technology Co., Ltd. (HEET) to clean contaminants from waste oils and convert it into jet fuel at a rate of 170 gallons (650 liters) per day. The project's goal is to assess the technical feasibility and cost of producing higher volumes of biofuel. "We are very happy to see the progress that has been made in the collaboration between Boeing and COMAC, especially the achievement in aviation biofuel technology," said Dr. Guangqiu Wang, Vice President of COMAC's Beijing Aeronautical Science & Technology Research Institute. "We will continue to work with Boeing in energy conservation and emissions reduction areas to promote the sustainable development of the aviation industry." Sustainably produced biofuel, which reduces carbon emissions by 50 to 80 percent compared to petroleum through its lifecycle, is expected to play a key role in supporting aviation's growth while meeting environmental goals. The Boeing Current Market Outlook has forecast that China will require more than 6,000 new airplanes by 2033 to meet fast-growing passenger demand for domestic and international air travel. Boeing and COMAC have been collaborating since 2012 to support the growth of China's commercial aviation industry. Their Boeing-COMAC Aviation Energy Conservation and Emissions Reductions Technology Center in Beijing works with Chinese universities and research institutions to expand knowledge in areas that improve aviation's efficiency, such as aviation biofuel and air traffic management. Biofuel produced by the China-U.S. Aviation Biofuel Pilot Project will meet international specifications approved in 2011 for jet fuel made from plant oils and animal fats. This type of biofuel has already been used for more than 1,600 commercial flights.